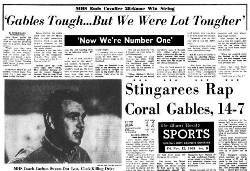 Miami High against Coral Gables High was always a big matchup in the 1950s and 60s when it came to high school football. The game played on November 11th, 1965 elevated the rivalry. Coral Gables was ranked first and Miami was ranked second in the state of Florida. Coral Gables High was the two time defending state champions and was riding a 28-game win streak. The winner would go to be the favorite to win the state championship. Miami High ended Coral Gables 28 game win streak with a 14 – 7 victory that evening. However, it wasn’t just the magnitude of the stakes that made this game so memorable. The attendance in the raucous Orange Bowl that evening was a state record to watch a high school football game. The estimates were anywhere between 47,000 – 50,000 people in attendance. It has been said that Joe Robbie pointed to the attendance at this game to help justify bringing an AFL team to play at the Orange Bowl in Miami. The Dolphins were awarded to Miami and played their inaugural season in 1966.